A great source of inspiration for funny awards comes from embarrassing moments at work. Whether it was an email sent to the wrong recipient, a resume left on the printer, or a quick snooze during an all-hands meeting, these stories become the stuff of office legend. Embarrassing moments at work are fair game for year-end award ideas - so long as the recipient is in on the joke and has a good sense of humor. There's no humor in needlessly embarrassing someone further. But if the event triggered a new office catch phrase, or the recipient themselves joke about it, by all means use this inspiration for your funny awards ideas. Wearing bathroom slippers to work while in a rush. Robert Hosking, executive director of OfficeTeam, encourages you not to fret. "Using humor can help you recover from uncomfortable situations. Occasionally showing a little vulnerability on the job also can make you appear more accessible and approachable to colleagues." We all goof up from time to time. Just laugh along and roll with the fun. 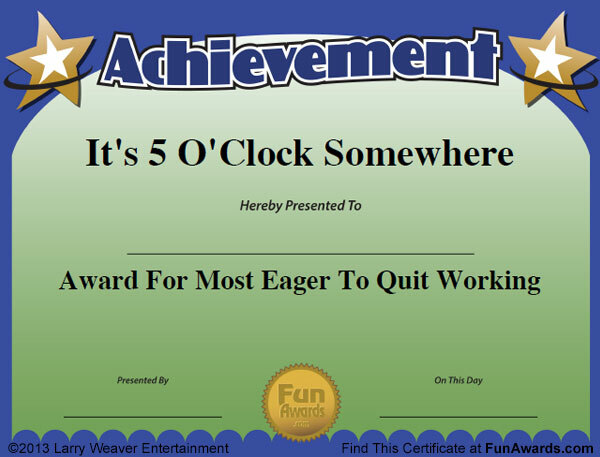 Who knows... come year-end you just may find yourself getting a funny award!